Ader left behind a body of work that borders a fine line between comedic and downhearted themes. Now in 2010, more than 30 years after his disappearance at sea, he is more influential than ever before. As is noted in the book Bas Jan Ader: In Search of the Miraculous, "He finds the truth of tragedy in the practical logic of bringing about existential decisions and emotional reactions by either pushing a situation to a point of crisis or by allowing a process to gradually reach a tipping point". Dutch modern master Piet Mondrian influenced many of the works of Bas Jan Ader, and in several of these works Ader directly references Mondrian in the subject matter. Ader's Untitled (Westkapelle, Holland) is staged in his native Netherlands, where Ader was filmed and photographed on a brick road leading to the Westkapelle lighthouse, which was an important and recurring subject in Mondrian's paintings. In Piet Niet, Ader adapts the same geometric structure and color schemes as Mondrian's abstract Composition paintings. In Pitfall on the Way to a Neo-Plasticism, Ader, dressed entirely in black, has fallen onto the brick road directing towards the Westkapelle lighthouse, resulting in him spilling the items that he is carrying; a plastic yellow paint can, a blue blanket and a red satchel, alluding to the primary colors in Mondrian's late abstract paintings. Mondrian's ideals of harmony and order are deliberately circumvented in the hands of Ader, who parodies the high seriousness of Mondrian's work. Ader graduated from the Otis College of Art and Design in 1965 with a BFA, and from the Claremont Graduate School in 1967. 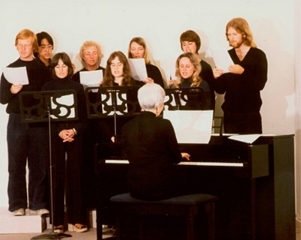 After graduating, Ader taught at many institutions, including Mount San Antonio College and the University of California, Irvine. Ader's work has been exhibited at various intuitions including: The Camden Art Centre, London, Museum of Modern Art, New York, and Centre Georges Pompidou in Paris.